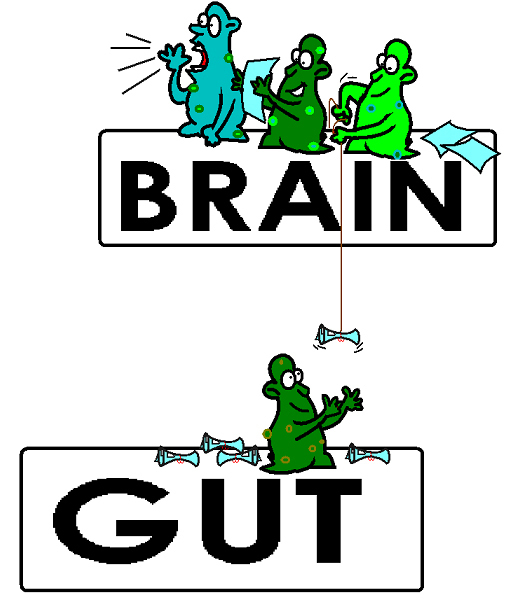 The present findings represent the first definitive evidence that high-fat diet-induced changes to the gut microbiome are sufficient to disrupt brain physiology and function in the absence of obesity. Specifically, data show that transplantation of microbiota shaped by high-fat diet, but not control low-fat diet, caused significant and selective disruptions in exploratory, cognitive, and stereotypical behavior in conventionally housed, nonobese, diet-naïve mice. The human gastrointestinal tract harbors as many as 100 trillion bacteria from up to 1000 distinct species, and this dynamic population of microbes participates in numerous physiologic functions including nutrition/digestion, growth, inflammation, immunity, and protection against pathogens. * The non-obese control mice, who had a healthy gut microbiome, ate low-fat (13.5% fat, 58% carbohydrate). The obese mice, who developed an unhealthy gut microbiome, ate low-carb, high-fat (20% carbohydrate, 60% fat). This entry was posted in Uncategorized on March 30, 2015 by Bix.